Most of the disappointed reviews for Destiny have been totally fair, but that's no reason to give up on what could become a great game. Yesterday I mentioned 3 features that Destiny desperately needs in order to fix some of its glaring social issues. I don't think there is any disagreement that, in its current state, Destiny provides a fairly hollow social experience that sends you on often-repetitive missions while providing very little context or explanation for what you are doing or why you are doing it. That doesn't mean it isn't still fun, but it has certainly disappointed a lot of players. I know that Bungie has grand aspirations for its epic space universe, but reading lore information from a mobile app while running around in a silent world doesn't really get the job done. So why should you stick around or give Destiny a shot in light of these disappointing issues? You can select create and select multiple characters. You have to be online to play. You constantly come across other random players in the battlefield. There are mobs that respawn every few minutes. There are instanced "dungeon" areas for your group. There is a "town hub" with vendors. There is gear... oh boy is there gear! You level up with XP, and even can choose between two different upgrade trees. I could add many more but this list would take up a few pages. Hopefully you get the idea! At launch, MMORPGs are generally not that great. When you think about Destiny as a launch day MMORPG, all of the self-detrimental social restrictions, basic feature omissions, and seeming lack of content becomes a bit more clear. I'm not making excuses for MMO games that have these issues at launch (and it is most of them), but merely trying to put things into perspective. Many modern MMORPGs, including popular titles like Star Wars: The Old Republic, have very few social features at launch. Some MMO games don't even have basic grouping abilities or chat when they are released, and even fewer have matchmaking ("LFG") queues or a variety of end-game content. Destiny is only just getting its first free raid mission this Tuesday, but already people are judging the game for its lack of content. This isn't necessarily a bad thing, as many MMOs are filled with "filler" missions to keep you playing for longer than needed. In Destiny, these are optional, and fun if you're playing with friends. I think a lot of the complaints are due to Bungie's general secrecy when dealing with questions about the their plans for future Destiny content. They have announced two different DLC packs (one of which is exclusive to PS4/PS3 owners for a year!) without any further details. How often will Bungie be releasing new content? What kind of content will it be? Multiplayer maps? Story missions? Strikes? New raids? How much of this content will be free? Without specifics, it's tough to judge the value of Destiny, especially when most of the announced new content costs money. It's one thing to release a game that is lacking content, only to constantly update it with great new content for free (*cough* PvZ: Garden Warfare *cough*). It's another thing to release a game that is lacking content then immediately start talking about paying for more. That said, Bungie seems to be taking a different approach to keeping their game fresh. New Destiny Content is Based Around "Events"
Bungie seems to be very big on "events" with Destiny. That is, allowing access to certain content on specific days of the month. Some of these events actually bring new content with them (like the forthcoming raid), while others provide fresh new takes on existing content. This is actually a pretty cool idea, and hopefully will keep players coming back to the game even after they have seen all the readily available content in the game. Bungie recently announced some details for their next few events, and as I write this, Destiny has a "salvage" weekend event going on. This event opens up an entirely new 3v3 multiplayer mode that provides access to some great new maps that aren't available in the standard matchmaking playlists. I've been enjoying these games, and it's exciting to visit a new location or two in the process. In the past, Bungie has allowed access to it's "Iron Banner" area in the Tower hub area, which adds an unbalanced playlist to multiplayer. Essentially, this is true PvP where all of the weapon and armor stats have full effect for each player. This is also a really cool bit of content for those that are really striving for the best gear in the game. While not yet announced, I imagine that we'll also see more mission-based content in the future, including new group events, or perhaps new missions in areas that are currently closed off in the existing planet maps. Destiny was in development for the better part of five years. It shows in the amount of polish the game boasts, from the stunningly gorgeous environments to the innovative UI. As pretty as this game is, it is safe to say that those five years weren't all spent developing just the content for the launch version of the game. Bungie has stated that they have years of content planned for Destiny, and I have a feeling there is plenty in store for players who are willing to stick with the game, or revisit it from time to time. The problem is that, as players, we really don't know what Bungie has in store for us outside of "just wait and see!" and a wink from their community managers and PR reps. This isn't good enough for people who have been playing the game for less than a week and are already just a few levels away from the current 30 level cap. I have a feeling that Bungie is aware of this, and I'm hoping we see a more clearly-communicated plan for new content in the near future. Destiny was designed to be played with friends. It may have been poorly designed that way, but that has always been the intent, nonetheless. If you are someone who enjoys playing online multiplayer games by yourself, you are probably not going to enjoy playing Destiny. I say this not to discourage solo players from trying Destiny, but to warn them that their experience with the game, at least in its current state, is not going to be as good as those who play the game the way Bungie intends it to be played. I am lucky to have a wife, several siblings, and a large group of friends who love Halo, and now play Destiny. Because of this, I never have to experience any of the story missions or multiplayer on my own. I can say from personal experience that playing Destiny with friends makes it far easier to forget many of the flaws in the game. I would go as far as to say that Destiny is a vastly better game when played with friends. That lonely feeling you get when you walk past groups of silent guardians? "We're too busy seeing who can flip over the other person while zipping around on speeders." Repetitive missions? "We barely even notice as we're yelling and laughing at each other during intense fire fights." Lack of content? "What are you talking about? We've spent hours of game time exploring the incredible environments and talking about life!" Those are the words of someone who has experienced Destiny with friends. This is where the ball is firmly placed in Bungie's court. If they don't make improvements to Destiny's social features, they will lose those players who came into Destiny expecting a solo-friendly campaign and multiplayer on par with other modern MMO games. If the game was meant to played with other people, it needs to be easy and enticing for a solo player to play with other people. If Bungie can do right by solo players by adding new matchmaking and social features, playing through the entire game will become a different experience for those who started playing solo, but got bored and gave up. To those players out there who frown at social/multiplayer gaming, do yourself a favor and accept the next fire team invite you receive, or maybe even go crazy and send a few invites yourself! Bungie may have not made it very easy to team up and communicate with other players, but if you put in a little more effort with Destiny, I guarantee you will have more fun. Bungie developers have said many times that Destiny was built from the ground up to receive content updates and tweaks. The extensive launch day patch notes are readily available, and Bungie has always been open to responding to community feedback. Like any other modern MMORPG, players should expect that new in-game features, as well as tweaks to existing features are going to start arriving as Bungie parses through all the player data and feedback over the following weeks and months. Does this mean that we'll actually see things like a functional voice chat system, or even proximity chat at some point in the future? I don't know, but I sure hope so. In fact, I would go as far as to say that the future of Destiny absolutely relies on those kinds of social improvements if it plans on staying relevant to modern gamers. Every MMORPG I've ever played has started out on rocky ground. 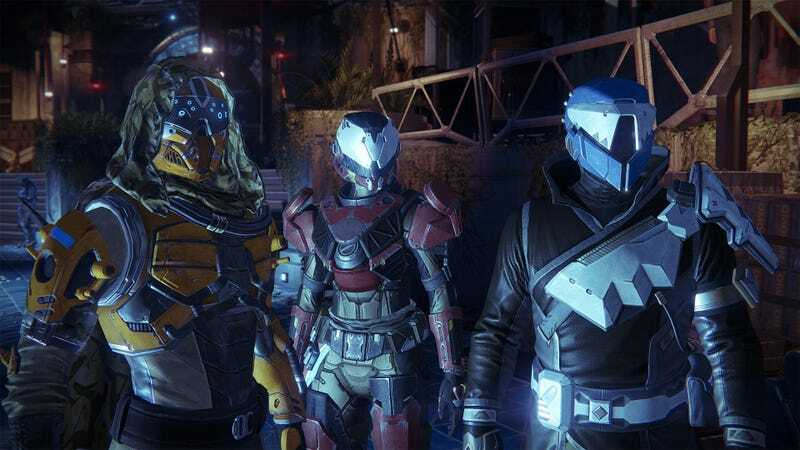 Lame social features, over-powered classes, unbalanced PvP, boring missions, and lacking end-game content are par for the course for almost all MMORPG games at launch, and Destiny appears to be no exception. The good news is, many of these games climb out of their launch hole to become fantastic, feature-rich titles that people enjoy playing for months and even years. I haven't lost hope in Destiny. I know that Bungie has some Aces up their sleeve, but I'm hoping they play them sooner than later. If you hold onto your cards without playing for too long, people will forget you're still in the game. You can get in touch with Matt "smi1ey" Dunn on Twitter @thesmi1ey.